Life didn’t want me to see Alexander Payne’s Downsizing. That’s how it felt, at least. Back in November, my first attempt to see the original sci-fi comedy was blockaded by the lack of my credentials. My second try, a whole month later, was sabotaged after I went to the theater, waited for over 90 minutes, only to be told the movie wouldn’t be playing due to some technical error. My third try was evidently the charm, it seems. But of course, I use that term loosely. For the resulting film is, like my previous two attempts to see it, a misfire, filled with promising starts and underwhelming results. If you have any hopes for this movie, consider them shrunk. Payne’s first high-concept, big-budget effort diminishes its potential. A long-brewing, intensely political passion project for Payne, the Oscar-winning filmmaker behind American dramedies like Election, Nebraska, Sideways, The Descendents, and About Schmidt, Downsizing was Payne’s blank check production. It was the acclaimed director’s rare chance to conceive a project well above his usual budgetary range and produce an imaginative, highly inventive social satire for our turbulent times — the likes of which aren’t normally distributed under the studio system today, unfortunately. It’s a great concept too. In a lofty effort to save our environment from the ongoing dangers of overpopulation, a team of Norwegian scientists discovers a way to literally downsize the human population. Shrinking humans down to five-inches, it’s an effective, socially-conscious effort to reduce our carbon footprint and assure we don’t use as many earthly resources, effectively saving the world in the process. A colony of miniature people produces only half a garbage bag of waste in two years time. It’s a revolutionary, money-saving change, an idea that once seemed impossible but now presents real, life-saving opportunities for many all over the world. And it’s obviously controversial. As the news spreads, people don’t know what to make of it. Questions are raised. Arguments are had. Nutjobs want to take away the rights of the small. In the midst of all this chatter and confusion is Paul Safranek (an affable Matt Damon), an average, everyman guy living (and struggling) in Omaha with his caring-but-concerned wife, Audrey (Kristen Wiig). Trying to move into a new house and adjust into the next stage of their marriage together, Paul struggles to find the money with his shabby living and unassuming life. When he first hears about downsizing, he’s shocked. When he talks to his shrunken high school buddy Dave Johnson (Jason Sudeikis), he’s convinced that downsizing is the answer to all their problems. But Audrey is less persuaded, even after Paul agrees to go through the downsizing process. And that’s when things start to take a turn for the worse in Payne’s broad-thinking, overzealous, and unrewarding new film. There’s quite a bit to like — and even love — in Downsizing. Beyond the fact that it’s an exciting, original, dynamic, and highly novel concept, Payne and fellow screenwriter Jim Taylor occasionally make excellent use of its liberating potential, notably around the first 45-60 minutes. The ideas it raises, the notions that it inspires, the conversations fostered between its characters are thoughtful, insightful, and periodically profound. The project has been in the works for well over a decade, and it shows. They have lots of big, bright ideas about the world of the small, and it’s one of the most invigorating concepts of the year. And though it’s sadly a bit bland to have a plain white man be at the forefront of this endeavor, Damon gives one of his better performances in some time here. Damon is usually at his best playing self-effacing guys in extraordinary situations. Whether it’s Good Will Hunting, The Informant!, or even the Bourne films, this is Damon’s forte, and Downsizing is no exception. He plays up the modest aspects of Paul’s life while never making it too Hollywoodized. You could easily imagine someone like Damon’s Paul living next door — whether he’s big or little. He’s a charming, endearing lead, and that helps bring weight and honesty to the opening of the film, especially the moments where he’s crunching numbers and trying to figure out how to make a better life for himself and his wife. That’s where Damon and Payne really excel. After a very exceptional first act, Downsizing loses steam quickly. As it wobbles uneasily into the second act, Payne and Taylor weirdly and miserably have less fun with the creative high concept, deliberately making it more mundane and plain in their approach. While that’s charming and more, err, realistic at first, as a viewer, that grows stale and cumbersome after the hour mark. If you have this fantastical, wonderful, super unique idea, why not get some enjoyment out of it? Why make it downtrodden? That’s one of the biggest misfortunes to come from Downsizing, which sadly only lives up to a little bit of its potential. And if you think I’m making too many “little” puns in this review, buckle up. 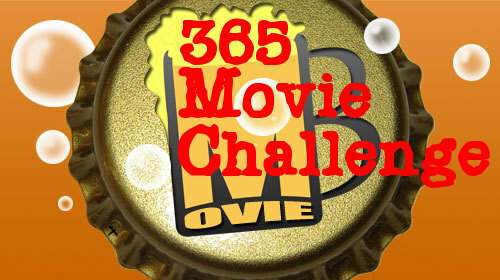 The movie has at least ten or fifteen more. While it’s cute, harmless, and pretty punny at first, it grows tiresome quick. And then there’s Ngoc Lan Tran, played by Chau. While the talented actress does the best she can with such a thin, poorly-written character, Ngoc Lan Tran is a regressive, grossly stereotypical portrayal of a Vietnamese woman, plain and simple. From her harsh broken English, seemingly played for uncomfortable laughs, to how she ultimately shepherds Paul’s white savior journey, everything about Ngoc Lan Tran feels terribly inconsiderate and, frankly, pretty racist too. I don’t want to assume Payne had poor intentions. At his heart, I’m sure he wanted to tell this story from a global perspective, shedding some light on the misfortunate in order to give Downsizing more impact. But that backfires considerably, and it’s a struggle to sit through any of the scenes featuring Chau’s character, despite the solid acting. Whether or not Payne had humble intentions with Ngoc Lan Tran, the portrayal does him no favors. Then there’s the tricky factor of Downsizing‘s running time. At its heart, Downsizing should be roughly 90-105 minutes long. Maybe 115 minutes, tops. Making it 145 minutes turns what could’ve been an entertaining, ingenious romp into a preachy, overbearing slog. Ironically, Payne and Taylor should’ve downsized their script into a less considerable shape and length. Having read the production script after watching the film, I can attest that it’s even longer in its written form. It’s a credit to the writers that they’ve had this screenplay under their wings for so long, bristling with ideas and concepts they want to explore and fighting to get it made over the past decade and a half. But sometimes, you need a friend to sit you down and talk some sense into you. I get the impression that Payne never had someone bring him down to earth and refine his initial vision. Much like Netflix’s similarly high-minded but disappointing Bright, it’s an enjoyable, perhaps even brilliant idea that never earns its full potential. And that’s a shame. Downsizing is legitimately one of my biggest filmgoing disappointments for 2017. As much as I want to champion it, as much as I want to celebrate Payne for getting this movie made under his gaze, this is a messy, bloated, overworked mini-disaster that’s somehow both half-baked and overcooked. 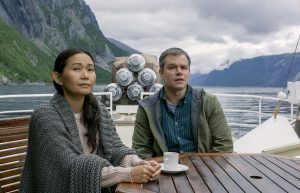 Despite its numerous successes, Downsizing fittingly and ironically spends too much time paying attention to the little details while ignoring the big, glaring issues that hold back its earned triumph. It’s clearly made by smart, forward-thinking people. And that makes its failures more staggering and disheartening. Most filmmakers have a failure or two. Unfortunately, Payne failed big time with Downsizing. Bummer. Take a Drink: anytime they highlight the characters’ short stature. Do a Shot: whenever Ngoc Lan Tran is introduced into the picture. Take a Drink: anytime the movie gets super preachy. Do a Shot: once you reach the ending. You made it, buddy. Congrats.